Outrageous New Icon for Rocky Flats! 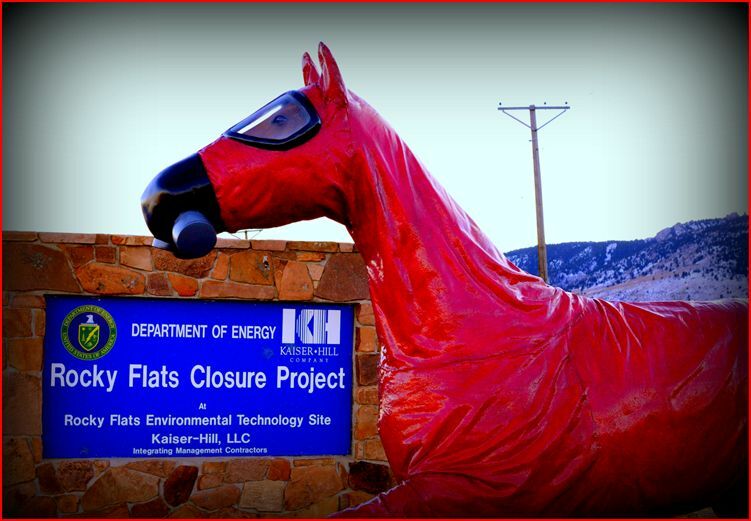 Artist Jeff Gipe’s horse with the Rocky flats closure sign off of Hwy 93. UPDATE: To donate to the artist for repairs of the recent vandalism, please visit his “go fund me” site. A local artist has decided to match the outrageous, radioactive history of Rocky Flats with a large, surprising work of art. Looking at Colorado’s newest historical horse sculpture conjures up images of the well know conversation-starting Bronco icon at Denver International Airport. It’s just as bright and confusing with a touch of disturbing, but it seems to have a much sweeter soul—which speaks to the “Wildlife Refuge” designation of Rocky Flats. It’s sure to leave viewers with more questions than answers. 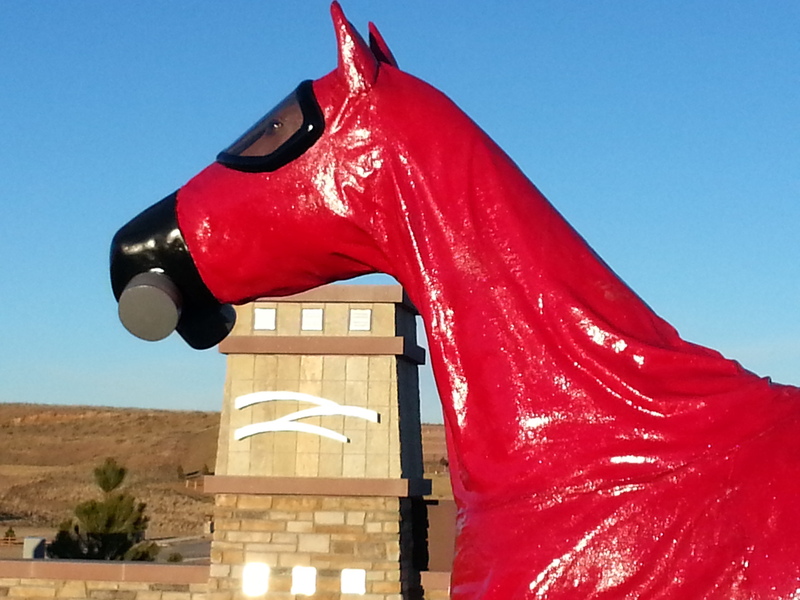 The life-size horse is wearing a magenta hazmat suit with black booties. A respirator partially covers a beautiful realistic face with thoughtful eyes. The artist, Jeff Gipe has been interested in issues surrounding Rocky Flats for quite some time and was relieved when a local group, Candelas Glows, began raising alarms about new housing developments being built adjacent to the former nuclear weapons plant. But Jeff has a much more personal reason that he’s spent thousands of dollars, hundreds of hours, and lots of sweat and tears making his horse creation come to life. Jeff’s father worked at the plant for 20 years and like many of his co-workers, now suffers devastating physical effects of working at one of the world’s most notoriously polluted plutonium processing sites. In talking with members of Candelas Glows, Jeff became intrigued with the idea of memorializing the site. 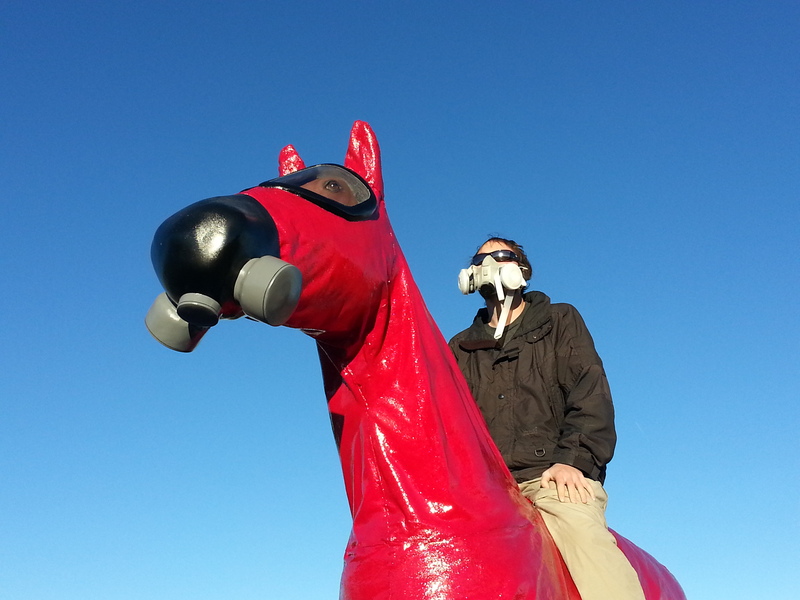 Local activist riding sculpture with matching respirator across from rocky Flats. Along with Candelas Glows and many community members, Gipe is concerned that Rocky Flats’ history is being ignored and that because of it, more people will be harmed. Located in a pristine-looking and beautiful part of the Front Range, the contaminated history of Rocky Flats is invisible: the radioactive accidents, the midnight plutonium incinerations, the corroded storage tanks, the sealed court documents, the historical FBI raid and the leftover plutonium waste buried there. “It’s up to people who know the history of the site, and artists,” says Gipe, “to make the invisible visible. To keep memory and even respect for the history of a critical Cold War site alive.” The horse may be shocking, but nothing compared to the controversial and sometimes shocking history it is trying to invoke. And its timing is perfect. After the September floods, activists and scientists are concerned that some of the waste buried at Rocky Flats may have risen to the surface and/or further contaminated groundwater. And in the last week of 2013, a land swap was completed which is considered to be a critical ingredient of the toll road proposed on the infamous site. 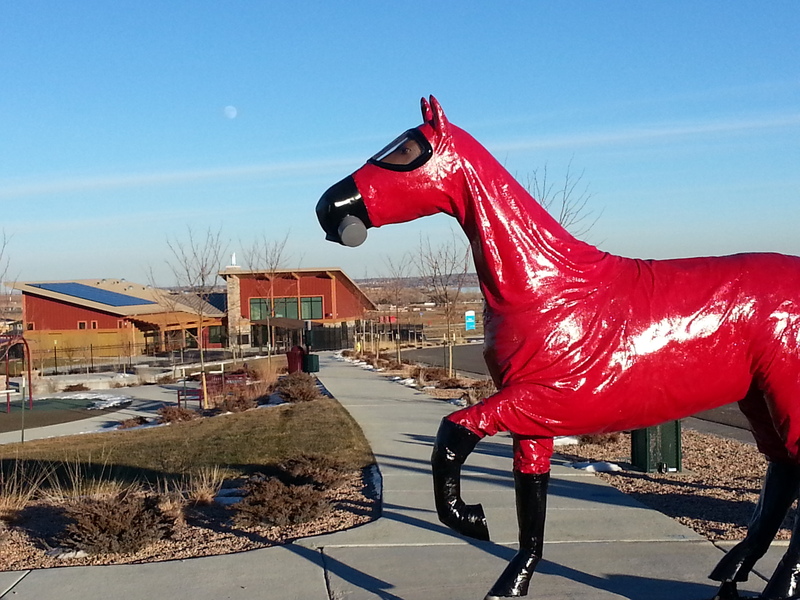 The 400-600 lb horse is lining up a couple of appearances, but is looking for a more permanent home. Gipe’s hope is that it be placed on Rocky Flats or land facing it to begin to memorialize the site and bring attention to its tumultuous and sure to be long-lasting history. For more, check out the Facebook page for more or email at candelasglows@gmail.com . 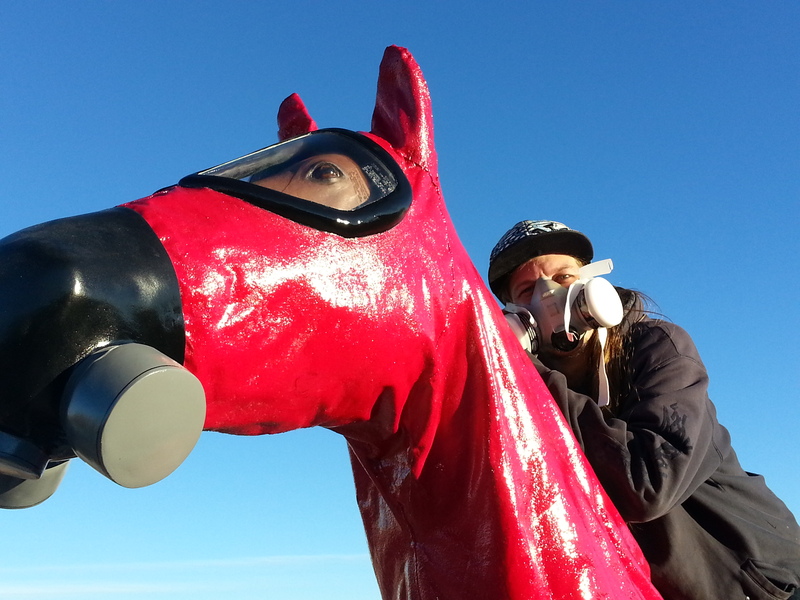 Close up of respirator-clad activist and horse sculpture. The artist’s icon with Candelas logo. The sculpture in front of Candelas’ recreation center and playground.